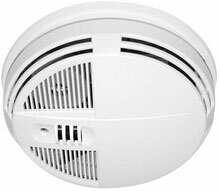 The GE Security 400 Series Smoke Detector has been discontinued. No direct replacement is available. The 400 Series Smoke Detector self-diagnostic, 4-wire smoke detectors continually monitor their own sensitivity and operational status, and provide a visual trouble indication if they drift out of sensitivity range or fail internal diagnostics.